You can attach an ISO to a VM at any time. It is not required to stop the VM to do this. You can only attach one ISO at any time, but the same ISO resource can be attached to multiple VMs at the same time. Login to the Control Centre and click Templates in the menu on the left-hand side. In the Select view drop-down, choose ISO. ISOs are organised into different categories, which are viewed separately using the Filter by drop-down menu. All of the ISOs uploaded by you will be located in the Mine category. Before attempting to use or copy an ISO you should check that it is in the 'Ready' state. This is shown in the Zones tab (see above). 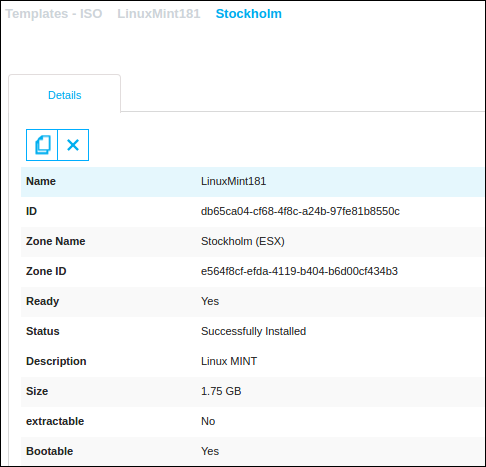 You can attach (or detach) an ISO to a VM at any time. It is not required to stop the VM to do this. You can only attach one ISO at a time. Click Virtual Machines in the menu on the left-hand side. Click the name of the VM that you want to attach to. Click the Attach ISO button . After a few moments a pop-up message 'Task complete' should appear. The toolbar button will then change to having a minus sign, , and the function of the button becomes Detach ISO. Clicking the button now will perform the detachment. You should ensure that the ISO is properly unmounted in the VM operating system before using the detach button.